The OSIRIS Narrow Angle Camera aboard ESA's Rosetta probe captured this image on March 21, 2014, showing Comet 67P/Churymov-Gerasimenko in the constellation Ophiuchus. The European Space Agency's comet-chasing Rosetta spacecraft opened its eyes in January after a 10-year voyage across the solar system and a long hibernation in deep space. For the first time since its wakeup call, Rosetta spied its destination. 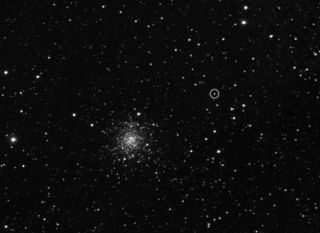 ESA released images Thursday (March 27) showing Rosetta's glimpse of its target, Comet 67P/Churyumov–Gerasimenko. "Finally seeing our target after a 10 year journey through space is an incredible feeling," Holger Sierks, the OSIRIS principal investigator from the Max Planck Institute for Solar System Research in Germany, said in a statement. "These first images taken from such a huge distance show us that OSIRIS is ready for the upcoming adventure." The light from the faraway, 2.5-mile-wide (4 km) comet doesn't even fill up a single pixel. To create the image, researchers had to obtain a series of 60–300 second exposures. It took 37 minutes for each image to reach Earth and about an hour for each to download, ESA officials said. The photos aren't the first the Rosetta spacecraft has taken of it comet. The target appears as a single point of light in pictures captured in 2011 from a distance of about 101 million miles (163 million km). This image of the Comet 67P/Churymov-Gerasimenko was taken with the OSIRIS Wide Angle Camera aboard Rosetta on March 20, 2014. It shows a wide field 25 times larger than the diameter of the full moon. Rosetta's view will only get better as it closes in on the comet, as this animation from ESA shows. The solar-powered probe is on track to enter orbit around the icy body in August. By then, Rosetta should have a 2-meter (6.5 feet) per pixel view of 67P/Churyumov–Gerasimenko, complete with surface features. A robotic lander called Philae, which is piggybacking on Rosetta, is scheduled to touch down on the comet in November. Securing itself with a harpoon and ice screws, Philae will drill samples and conduct experiments with its 10 science instruments, as Rosetta looks on from above. If all goes as planned, Rosetta and Philae will continue their observations through December 2015. Rosetta's journey has been long and winding. The $1.4 billion mission launched in March 2004 and completed four speed-boosting planetary flybys, three of Earth and one of Mars, and flew past two asteroids before entering hibernation mode in June 2011. At that point, Rosetta was nearing the orbit of Jupiter, the coldest and most distant leg of its journey around the sun. Rosetta awoke on Jan. 20., nearly 418 million miles (673 million kilometers) from the sun.